The California native won gold in the women's halfpipe. "It really hasn't sunk in yet," she said. 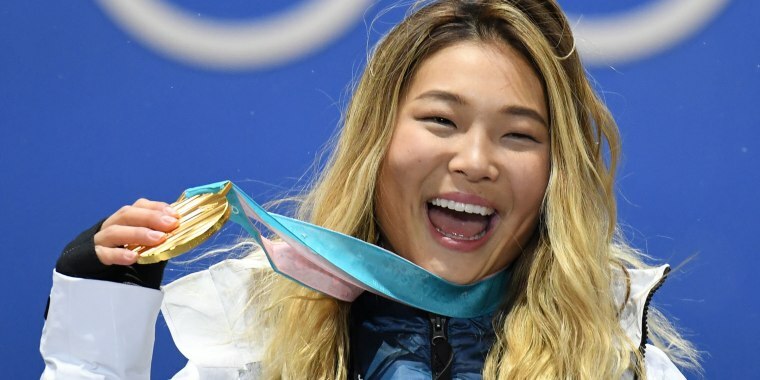 American snowboarder Chloe Kim had already secured the Olympic gold with her first run down the halfpipe, but after spilling on her second round, she knew she had to prove to herself that she could do better. Her final run landed her a nearly perfect score. “As an athlete, as a snowboarder, I want to do the best I can," the beaming 17-year-old California native told TODAY. "And even though I knew I was in gold, I didn’t want to go home knowing that I could have done better at the Olympics." Kim scored a 93.75 on her first run down the snowboard halfpipe, giving her such a huge lead over the competition that she was free to take a victory lap during her final, third run. Instead, she demonstrated to the world why she had become an Olympic star, living up to months of hype and delivering back-to-back 1080s. Her final score, a nearly perfect 98.25, stamped her gold medal spot and etched her in Olympic snowboarding history by becoming the youngest female medalist in the category. “It really hasn’t sunk in yet,” she told TODAY’s Hoda Kotb and Savannah Guthrie. Kim said that she was holding back tears while the American national anthem played during the medal ceremony. Among those memories will be images of her family’s reaction to her winning the gold medal. Kim said everyone, even her grandmother, came to watch her compete. Her father, who used to drive nearly six hours from their home to her training site every day, looked the most excited, she noted. “I was seeing photos of him, and he looked stoked,” she said. Kim also answered one of our burning questions: What music had she been listening to during her runs? "I don't really remember," the teen admitted. "It could have been 'Paparazzi' by Lady Gaga. Or it could have been 'Toxic' by Britney Spears." Hoda and Savannah got to poke some fun at Kim for the tweet she posted about being "hangry" between her second and third run. After saying they didn't want her to be hungry, Kim started to look around and asked: "Is the food coming? You got me so excited!" Eventually it came: a platter of breakfast sandwiches, bowls of ice cream and churros. "I'm so happy right now," Kim said. "The food brings me so much joy."